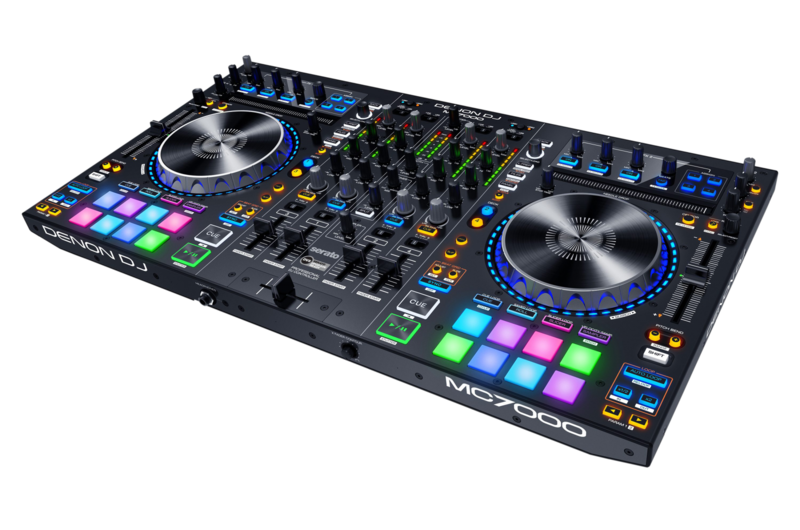 The MC7000 is the professional DJ controller with 4-channel Serato DJ capability and dual USB connections. Coupled with Denon DJ’s legendary build quality and superior 24-bit audio reproduction, this is a no-compromise controller perfectly suited to both mobile and club DJs looking for the next evolution of Serato DJ controller. This article walks through a number of frequently asked questions about the MC7000. Is the Denon DJ MC7000 a standalone controller? What are the system requirements for the Denon DJ MC7000? Which DJ software comes with the Denon DJ MC7000? What type of audio interface does the Denon DJ MC7000 feature? Can two DJs quickly switch off back and forth when using the Denon DJ MC7000? What audio inputs and outputs are included on the Denon DJ MC7000? Does the Denon DJ MC7000 support a mini Innofader crossfader? Is the crossfader on the Denon DJ MC7000 user replaceable? Is the Denon DJ MC7000 supported with Virtual DJ, Traktor or any other DJ program? Does the MC7000 have built in effects? What are the size of the platters on the Denon DJ MC7000? Are the pads on the Denon DJ MC7000 velocity sensitive? Is the Sampler button only for PC/Serato use? Does the MC7000 have a "Vegas" mode? What is the Denon DJ MC7000 outer housing made out of? What's the weight and size dimensions for the Denon DJ MC7000? Does the Denon DJ MC7000 unlock Serato DJ? Is DVS supported with the Denon DJ MC7000? What expansions come with the MC7000? and how to get them? No, The MC7000 is not a standalone controller. Please take a look at our MCX8000 for standalone capability. Serato DJ is included for free with your Denon DJ MC7000 purchase while the unit is plugged in. Upon registration (Denon DJ Account Sign In), you will receive a free code for Serato DJ Pitch 'n Time Expansion, Serato DJ Flip Expansion and Serato DJ Video Expansion. Software download card included with instructions inside the box. The Denon DJ MC7000 features a built-in professional 24-bit / 44.1 kHz with dual USB 2.0 audio interface. Yes! MC7000 has dual USB connections. These two USB audio interfaces enable two DJs to play together (on their preferred DJ software) or ‘hand off’ in a truly seamless, uninterrupted manner. Note: Use the Stereo/Mono switch to set the channel configuration of the Master Outputs: Stereo (binaural audio using separate left and right channels) or Mono (summed monaural audio through both left and right channels). Yes! The Denon DJ MC7000 can be used with the mini Innofader PNP P.
Yes. If necessary, reach out to the Denon DJ support team for assistance finding a replacement crossfader. The Denon DJ MC7000 has been developed from the ground up as an amazing controller for Serato DJ. Denon DJ and Serato have carefully tuned and mapped each control to create the best possible out-of-the-box user experience with the included Serato DJ software. However, since the MC7000 hardware controls appear to your computer as a generic MIDI device, it can indeed be custom-mapped to any other DJ application that supports user or developer-created custom mapping. The MC7000 does not have any built in effects, but you will have control over the Serato DJ effects with this unit. What are the size and functions of the platters on the Denon DJ MC7000? The Denon DJ MC7000 has dual 5 1/2" hyper-responsive platters. The capacitive, touch-sensitive platter controls the audio playhead when the wheel is touched and moved. When the Vinyl button is activated to ON, you can move the platter to scratch the track as you would with a vinyl record. When the Vinyl button is deactivated to OFF (or if you are touching only the side of the platter), move the platter to temporarily adjust the track’s speed. While editing a loop, move the platter to adjust the Loop In or Loop Out point. Press and hold the SHIFT button and then move the platter to move quickly through the track and search through it. To turn the LED Off, hold the SHIFT button and press the Deck (1, 2, 3 and 4) button on the size you want the LED off. The Denon DJ MC7000 has 16 velocity-sensitive trigger pads with backlight RGB feedback. It includes 10 pad modes for hot cues, loop slicing, and sample triggering and rolls. Yes, the Sampler button will activate the Sampler Mode to trigger the SP-6 Sample Player in Serato. It does! With the MC7000 powered OFF, power the controller ON while holding down the VINYL button. To turn off Vegas Mode, you will need to turn off the controller. The Denon DJ MC7000 is made out of a solid rugged metal chassis. Yes! Simply download Serato DJ and connect the MC7000 to your computer. Yes! DVS is supported (DVS expansion pack sold separately). Channels 3 and 4 can be used for DVS control. Once you register the MC7000, you will receive a free code for Serato DJ Pitch 'n Time Expansion, Serato DJ Flip Expansion and Serato DJ Video Expansion. What is Pitch ‘N Time? The Pitch 'n Time DJ expansion pack for Serato DJ users allows you to shift the key of your tracks and sync the keys of multiple playing tracks together. Speed up or slow down your tracks to extreme tempos while maintaining perfect key and being able to cut and scratch without any loss in audio quality. The Pitch ‘n Time Expansion Pack also gives you access to the all-new ‘Pitch Play’ performance pad mode (Shift + Sampler). Check it out today! 1. Make sure you are running Serato DJ 1.9.4 or higher. Connect your MC7000. 2. Click 'My Serato' from the bottom right in Serato DJ. Log into 'My Serato' using your serato.com email address and password. 3. Just below your account name in the top right corner click ‘Enter Voucher Code’. 4. Enter your Pitch ‘n Time available on your account, and click ‘Activate’. 5. Pitch 'n Time DJ will now be enabled and you'll see the new Pitch 'n Time DJ logo inside the virtual decks. For more help activating and using the Pitch ‘n Time Expansion Pack check out the link below. Flip allows you to record and playback cue point and censor actions. The simple, yet effective control set designed with the DJ in mind allows you to reimagine your tracks in unlimited ways. Extend or shorten, make clean edits or completely remix and reshuffle your tracks. Use Flip with Quantize cue points on to get perfect edits every time! 5. The expansion will now be enabled. For more help activating and using the Expansion Pack check out the link below. What is Serato DJ Video? Serato DJ Video will allow you to control the playback of videos files just as you do with audio. Incorporate visual effects and transitions as well as your own promotional graphics. Add custom visuals to existing tracks in your library or mix music videos or both. Serato video supports a wide array of video file formats on both Mac and Windows systems. Whether you are a customer or dealer, if you already own a Denon DJ product, or if you just have pre-sales questions, the Denon DJ technical support team is available to help! Visit the link below to connect with any of the following support options: online community support, phone support, email support.